So, going through my Hero Arts stamps I decided that this set from 2013 would be great since summer is almost here, and I am ready. So, after going through my stash and finding the sets I wanted to use, I made my plan. Using watercolor paper and my distress inks I went to work. The beachy area is completed using Wild Honey and Dried Marigold. The water area is Mermaid Lagoon, and the sky is a combination of Broken China and Tumbled Glass. Once it was dry I used a cross stitched globe die to cut out the section for my shaker. 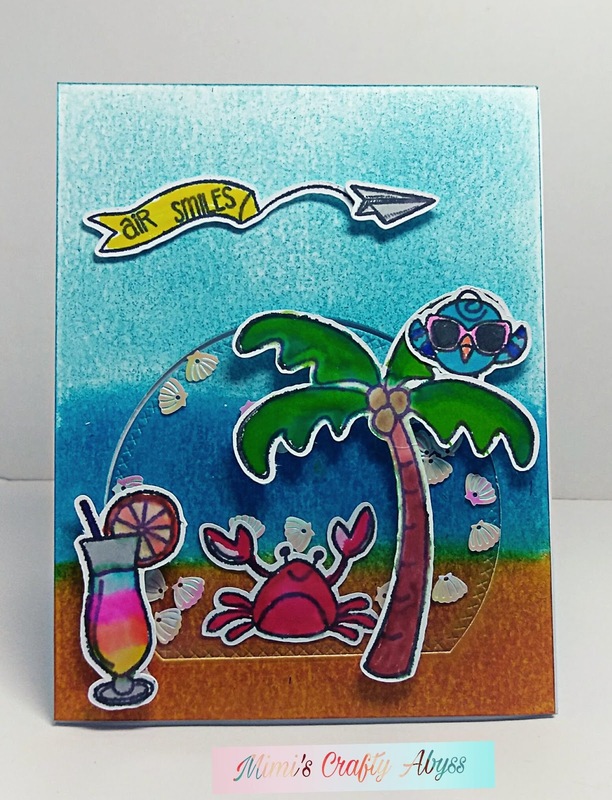 I stamped the Palm Tree, Crab, Bird, Plane, and banner with Gina K Black Onyx Permanent Dye Ink and used my Scan n Cut to cut out the images. Using my Zig CCRB Markers I colored the images. The Crab is in the shaker section with all the little shimmery shells. I used double stick tape and tear tape to adhere all my elements together. What a cute card LeeAnn! I love your watercoloring and those sequins shells are so adorable. Thank you for sharing with A Blog Named Hero.